Under the new policy, mothers can take 16 weeks of paid leave with benefits, and fathers can take up to eight weeks, each time they have a new child via childbirth. Both parents receive eight weeks off for new children via adoption, foster child placement or surrogacy. This change is a significant increase for Yahoo employees, particularly mothers, who will basically get twice as much paid time off. Under the old policy, moms received eight week paid after pregnancy, or 10 weeks if they had a C-section. Yahoo will also give new parents $500 to spend on such things as house cleaning, groceries and babysitters, plus Yahoo-branded baby gifts. Mayer’s decision, which brings the Sunnyvale-based Yahoo closer to Silicon Valley titans Google and Facebook, could help repair the damage as she works to turn around the struggling media giant. But it doesn’t only make sense from a public relations standpoint, observers said. The new policy could fit into a broader corporate strategy to attract and retain more talent and ultimately improve Yahoo’s financial performance. Companies who provide “everything” to their employees, such as free lunch and daycare sites at Google, do better financially in the long run because there is nothing to “distract” their workers from working, Sklar said. From the moment she became Yahoo’s new chief executive last year, Mayer, 37, has been seen as a symbol of corporate gender politics. She took the job when she was five months pregnant and worked through a two-week maternity leave that ended in October. Her decision to return to work so quickly attracted both praise and criticism – praise for showing that a new mother could continue to steer a Fortune 500 company, and criticism for failing to set a realistic expectations for America’s working moms. Mayer drew praise for adding perks such as new iPhones and free food, cutting company bureaucracy and redesigning work spaces. Many of those amenities were standard at her prior employer, Google. 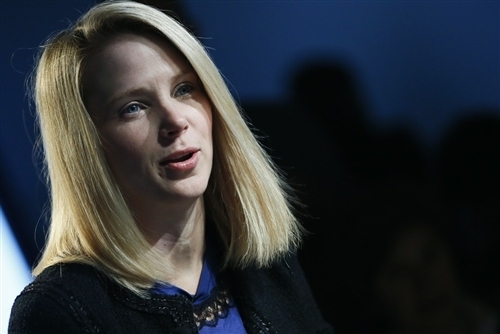 In February, Mayer sparked another debate when she decided to end Yahoo’s lenient telecommuting policy. Employees with existing work-from-home arrangements were told they had to start coming into the office or look for another job. The move reflected Mayer’s an all-hands-on-deck approach to turning around Yahoo and make it more competitive. But she was again accused of making it harder on working parents. But her decision to double family leave for new parents from 8 weeks to 16 weeks puts Yahoo in the same ballpark as her Silicon Valley rivals: Google gives between 18 and 22 weeks off to new mothers, and Facebook told the New York Times that it gives new mothers and fathers four months of paid leave. A Google spokeswoman said that all the Mountain View-company perks – which include preferred parking for expectant mothers and $500 in “baby bucks” to spend on things such as takeout dinners, like Yahoo is now offering – are so that life can be as smooth as possible for new parents. That’s of course, the spokeswoman noted, so that they can come back to work fully rested. In California, workers are eligible for six weeks of partial pay through the state’s disability benefits program. Mayer’s move also comes amid a broader debate in America about the country’s commitment to family leave. The United States, which hasn’t updated its Family and Medical Leave Act in 20 years, ranks among the worst of all developed countries. Sweden, Denmark Russian mothers get at least a year off paid and Canadian mothers get 50 weeks off paid. The U.S. law requires large companies to provide 12 weeks of unpaid leave to employers who need to care for a newborn child or an ill relative. And that relatively stingy benefit covers only workers who have been at a company for at least a year. That leaves millions without access to the benefit. Many more cut their absences short because they can’t afford unpaid leave. 20 + Telecommute Positions for UnitedHealth Group Pay The Bills and More | Pay The Bills and More!